Residence Inn Atlanta Downtown provides spacious guest suites in a beautifully converted historic downtown property. Our complimentary services include a daily hot breakfast buffet, light evening snacks Mon-Wed with complimentary, beer and wine. Wireless internet access, USA Today and weekday grocery service are also included. We offer 24hr room service provided by Landmark Diner, 24hr access to our onsite exercise facility with prominent views of world famous Peachtree Street, a fully-equipped business center, ATM and coin-operated guest laundry facilities. Every suite includes a living area and full kitchens with refrigerator, microwave, stove top, coffee maker, toaster and dishwasher. 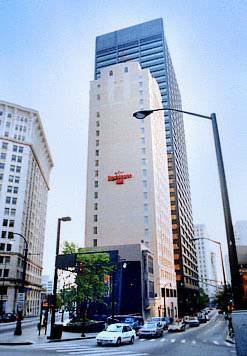 Were located across from the Peachtree Center MARTA station, for easy access into Atlantas airport. Were a short walk to the GA Dome, Philips Arena, World of Coke, GA State Univ, GA Aquarium, The Tabernacle, King Center and Rialto Theatre. Whether for work or for play, Residence Inn Atlanta Downtown has it all!